- Perfect Fit: Seamless match your Fitbit Alta HR and Fitbit Alta watch. - Water Resistance: These newest alta bands are sweat, rain and splash proof. - Premium Material: Premium TPU material gives you a comfortable wearing experience. Not fading and non-toxic. - Easy Replacement: Unique design of the clasp and buckle make you easy to change the strap and never fall off! - pink, blue, navy, coral, teal, black, gray, white, purple and lavender. - Easily mix and match different colors of bands to express your personal style. - Suitable for Small (6.3"-7.5") and Large (6.3"-8.7") wrist. - You can adjust the size and tightness of the strap according to different occasions. 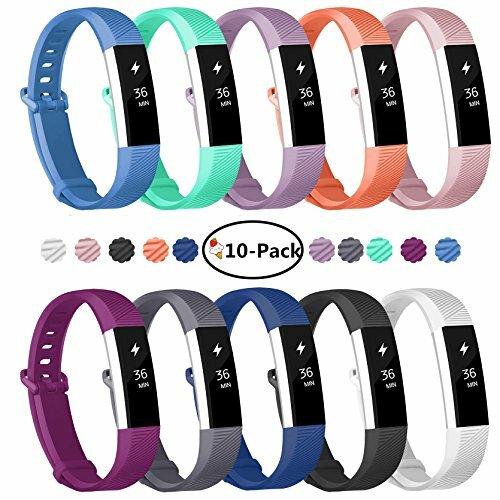 - 10-Pack Fundro Fitbit Alta Bands in different colors. - No tracker or other accessories included. - Way one: On this page, click on "Fundro" next to "Sold by", then click on "Ask a question" on the right top of page. - Search "Fundro Band" for more bands and accessories offered by Fundro store. ❤ 24 Months Warranty: Hassle free replacement or money back during the warranty. If you have any questions about this product by Fundro, contact us by completing and submitting the form below. If you are looking for a specif part number, please include it with your message.